Duke tries to get early baskets in transition and then going into a motion offense. To get easy baskets in transition, one post player O5 sprints up the court ahead of the offense and could get a long pass from O1. 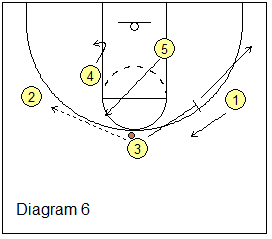 Meanwhile the wings O2 and O3 sprint to the wings and space out wide on the 3-point arc. O1 is always looking to pass the ball up the court (diagram 1). 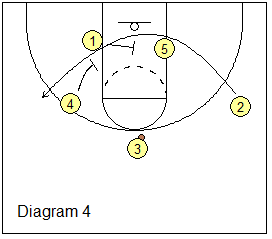 O4 is the inbounder off a made basket and is a trailer to the offense. 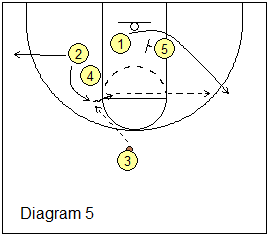 Off a missed basket, if O5 is the rebounder, then O4 would run the court and O5 is the trailer. 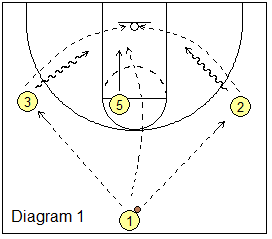 If the pass goes to a wing O2 or O3, the wings have the options of shooting the 3-pointer or driving to the hoop. Or they should look at O5 posting up inside (diagram 2). As soon as O1 passes to the wing (here O2), he cuts through to the opposite block area (diagram 2), as O5 posts up ballside. Diagram 3 shows the trailer O4 screening for the opposite wing O3, and O3 moves to the top. Diagram 3 also shows O2 might have a dribble-drive to the middle as an option, or a pass to O5 posting up, but if not, he passes to O3 at the point. After passing, O2 cuts inside around screens from O5, O1 and O4 (diagram 4). O2 might curl around O4 for the pass from O3 (diagram 5), or if the defender cheats, O2 could bump out to the corner instead. 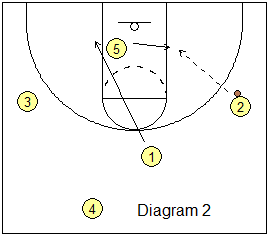 This is basic motion offense as O2 reads the defense. After screening for O2, O1 cuts around O5 to the right wing (diagram 5 below). But if nothing is open so far, let's have O3 pass to O2 on the left wing (diagram 6). 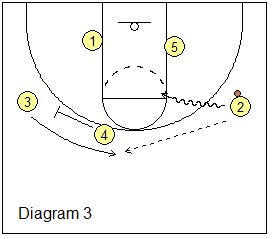 O3 screens away for O1 and moves to the weakside corner as O1 cuts up a little on the arc. Duke refers to this as "continous screening" action. O4 posts up as the opposite post O5 cuts up to the high post (diagram 6). Duke likes to have one post high and one low for the hi-lo options. If the pass goes to O5, he looks to pass hi-lo to O4 sealing for position inside. Notice that we have two excellent shooters spotting up on the arc on the weakside - O1 and O3, and O5 could pass to either for a 3-point shot. Coach's Clipboard All-Access Premium Membership - join today! Really one of the best bargains available today for coaches and players. Immediate online access, comprehensive downloadable playbook included with offenses, defenses, plays, drills, coaching and player tips, animated diagrams, video clips, mobile-ready, pdfs for print-outs, and more! Coaches... act now and get a group membership (deeply discounted) for all your coaches! Membership, special deals, basketball CDs, DVDs, downloads, coaching and training aids, and more! Dr. Jim Gels, aka "Coach Gels"
Click here to unsubscribe (include your username in the email).